One of my lovely readers, Ann from the U.K., asked me to write a tutorial on making Bow Cards. These fabulous creations are usually made with a template that you have to cut out by hand or set up in a computerised die-cutting machine. After looking at a few examples I was certain I could reproduce the look with some tools and supplies I had on hand. 1. First of all you'll need to choose some nesting dies. I used a stitched oval set by Paper Roses, but you can use whatever you have in your craft room. The dies need to be elongated with a wider middle section so that when the pieces are folded in half they resemble the loops of a bow. Experiment with the different shapes you have in your collection to find what looks best. 2. Cut four small ovals from patterned paper. Using the next size die, cut four ovals from a plain, heavy weight paper (I used white sketch book paper). Go up another die size and cut four more ovals from patterned paper, the same as the first or something that co-ordinates. Go up yet another size and cut four more ovals from plain heavy weight paper. These 16 ovals will form the folds of your bow. You'll also need the bow tails, which I cut from patterned paper with a "V" shape punched in one end. Mine are 2" wide and 4" long... but it doesn't really matter what size they are, just try to keep them in proportion with your ovals. 4. Use a thick pen or cylindrical object to shape the sections of your bow. You want a nice rounded curve, not a sharp fold. 5. On the back of each oval, apply strong adhesive to one end. 6. Pinch the ends together to form your loop. 7. Repeat for each of the ovals. Use clamps or clips to hold them closed while they dry, you want them very secure before you start assembling your bow. 9. While your loops are drying, work on the centre section. Not only will this piece hold all the loops together, it will also be the focal point of your card, so decorate it as desired. 10. Construction time! You're going to attached the eight loops and two tails to either side of your circle base using strong adhesive. The idea is to position everything so that it looks like a large ribbon gift bow. 11. Start by adhering two small loops on one side of your circle. The loops should be glued to the back of the circle so that a small section of the patterned paper disappears beneath. The loops should be nice and close together. 12. Add the other two small loops on the opposite side of the circle. Again you want to keep them nice and close together. Once the adhesive has dried, you can add the large loops over the top, keeping each pair close together and centred behind the two small loops. 13. The tails are added at the very back of the bow, over both sets of loops. If you've made them long enough, the tails will also help hold everything together. 14. Prepare a card base for your bow. Mine is 51/2" square, and I've added a piece of patterned paper and a punched strip of white paper in the centre. I'm also adding a little sentiment tag and a small organza bow. 15. I secured my bow to the front of the card with a piece of foam tape in the centre and glue on either end of the tail. Add any extra embellishments you like and your card is done! Stamps: "With All My Heart"
All photos and written instructions are copyright Beccy Muir. Wow Beccy, what a beautiful wish card! Thank you for the tutorial, you explained the making process of the bow thoroughly. I'll try to make one myself in the coming days and post it online. Very clever - looks stunning. Wow Beccy. This is so clever. How fabulous! Elegant, clever and yet simple to make....or is it your wonderfully clear tutorial that makes it so? 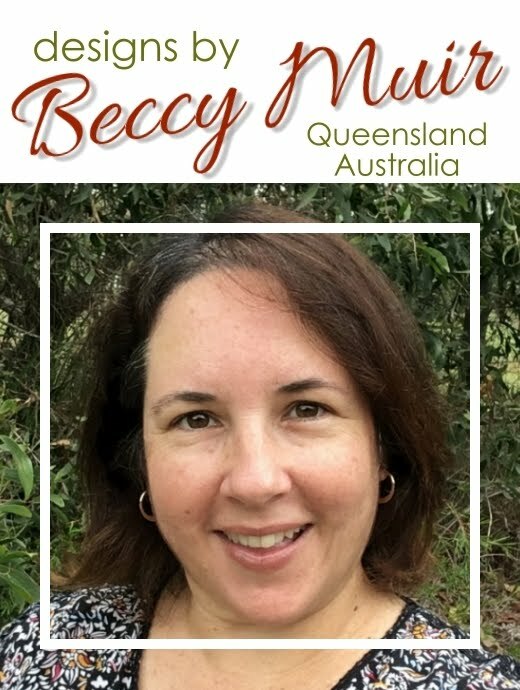 Thank you for a very good tutorial, Beccy! Great tutorial Pretty card! Thank you. Wow this is stunning!!! Thank you for sharing how you made it. Beautiful card with bow. Thanks for the clear tutotial. Thanks for another great tutorial. I used it to add a bow to an ordinary take-out bag to make it not so ordinary. Thanks for this beautiful tutorial. Just love this. Ones again a BIG thank you.